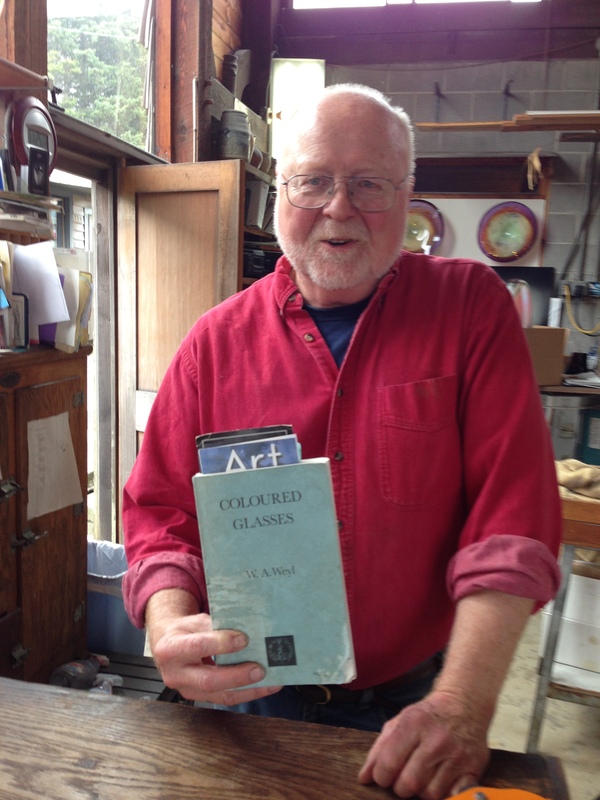 Glass blower Jim Kingwell poses with a book—by a Penn Stater—that he says he couldn’t create his art without. A couple of weeks ago, after two days of admiring the art at Icefire Glassworks in Cannon Beach, Ore., my husband and I finally chose a bowl for our anniversary present to each other. Buying something special on summer vacation has become a tradition for us, and the Pacific Northwest, our favorite outdoor playground, has such a great tradition of glass blowers that we’ve recently splurged on some beautiful pieces. This time, as we filled out the shipping form, one of Icefire’s artists, Jim Kingwell, jumped up from the register and ran to the back of the gallery, where the artists work. This seemed a little odd, until he came back clutching a well-worn paperback book. “I love meeting people from State College,” he said, smiling. Why? Because of the book. It’s called Coloured Glasses, and it was written by Woldemar A. Weyl, “Professor, and Head of the Department, of Mineral Technology, Pennsylvania State College.” Kingwell told us the book is the bible for glass blowers, by far the best resource for understanding the properties of colored glass—even today. The book was first published in 1936. It turns out that Weyl was a glass prodigy in his native Germany, which he left—for a visiting professorship at Penn State—at about the time his soon-to-be classic book was published. He returned for one year to settle his affairs at home, then settled in full-time at Penn State in 1938. This interesting piece by Michael Bezilla ’75g, ’78g calls Weyl a “living legend” in his field. Kingwell has no doubts. He’s trained in ceramics, but he said if he went back to school, he’d study a different area of materials science—glass. Probably at Penn State. Entry filed under: Uncategorized. Tags: glass blowing, Icefire Glassworks, materials science, Oregon, Woldemar Weyl.